The first official trailer for Aaron Sorkin’s upcoming Steve Jobs biopic has been released on YouTube. In the trailer, Universal Studios gives us a brief on-screen look at Michael Fassbender as Steve Jobs, along with Seth Rogen as Steve Wozniak, Kate Winslet as Mac engineer Joanna Hoffman, and Jeff Daniels as former Apple CEO John Sculley. 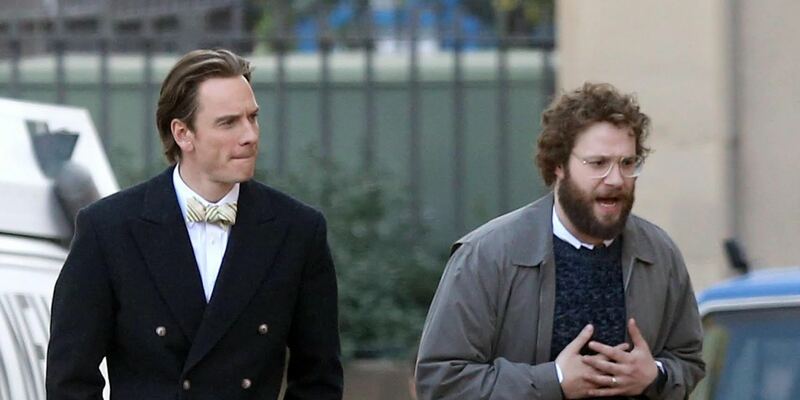 Shortly after principal photography began for “Steve Jobs,” we saw our first images of Fassbender and Rogen in costume. Those images were from a different scene than the trailer, which means we get an even better idea of how the two actors are handling their respective roles of Jobs and Wozniak. Universal’s new Steve Jobs film was written by Aaron Sorkin and directed by Danny Boyle, and is expected to debut in theaters on Oct. 9 2015. The choice of Fassbender for the role of Steve Jobs is definitely interesting, since Sorkin initially dismissed the “12 Years a Slave” and “X-Men: First Class” actor as some sort of nobody. Later, however, Sorkin revealed that he had come to think of Fassbender as “a great actor whose time has come,” after Boyle cast him in the role. The preview does not provide a lot of information about the upcoming film, but it does allow you to hear the building intensity in Fassbender’s voice as he prepares for one of the three product launches that defined Apple’s strategy and vision towards personal technology. Be sure to check out the trailer below. If the video fails to load, you can click this link to go straight to YouTube to view it.